The Frontier Emergency Water Filter System is ideal for hiking, travel, and emergency preparedness. It is the perfect addition to your 72 hour emergency kit. One unit will filter up to 20 gallons (75L) of water. 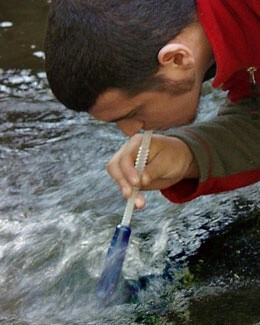 The Frontier Filter is tested and certified to Remove >99.9% of Cryptosporidium and Giardia. The Frontier Emergency Water Filter System is also easy to operate, just attach and expand the straw, submerge the filter end into the water source, and drink through the straw. Ultra light and compact, the Aquamira Frontier Emergency Filter System weighs less than one ounce and easily slips into a day pack, shirt pocket or travel luggage and is always ready when you need it. The Frontier Filter is the ideal alternative to heavy, bulky and expensive pump filtration units when space and weight are primary factors. Activated coconut shell carbon helps reduce waterborne chemicals, improves water taste and eliminates odors. 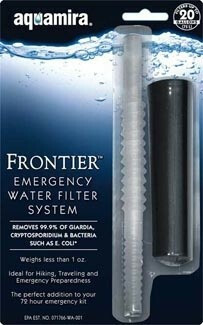 Use the Frontier Emergency Water Filter System to drink from any bottle, cup or directly from water sources. Aquamira® Filtration Technology begins with a proprietary blend of microscopic carbon, binder and antimicrobial particles. This blend of particles is heated beyond the melting point of the binder material until the particles adhere to each other in a process called sintering. The result is a highly porous, carbon impregnated filter block with a tightly controlled pore structure. Aquamira Filtration Technology incorporates both mechanical and adsorptive filtration processes to remove both physical and chemical contaminants. Aquamira® Filtration Technology is tested and certified to remove >99.9% of Cryptosporidium and Giardia*. (Test Results are available upon request) The activated coconut shell carbon reduces waterborne chemicals, improves taste and eliminates offensive odors. Light Weight (±20 gr. ), portable and easy to use the Aquamira Frontier Emergency Water Filtration System is an ideal choice for emergency kits, foreign travel, backcountry outdoor and anywhere water is questionable. * Although the Frontier Filter does reduce bacteria and virus, it is not certified to remove >99.9999% of bacteria and >99.99% of virus required by the US EPA water purifier standard. For maximum protection, use in conjunction with Water Treatment Drops or Water Purifier Tablets.